Contract manufacturing has been in existence for many years, through good times and bad, and always remained a predominant role in the industry of serving OEMs (Original Equipment Manufacturers) with quality products at lower prices than the OEM's cost. Major internal and external factors have tried to disrupt the industry but failed because mathematics prove that the concept of outsourcing, when done carefully and correctly, has unmatched rewards compared to completing the work in house. 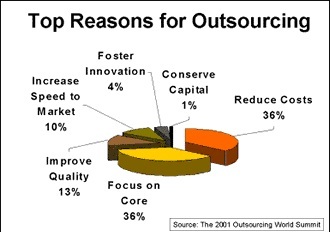 The great depression, multiple recessions, the industrial revolution, the technological revolution, numerous standards relating to quality and the increased global competition hasn't changed the original model of outsourcing production once a part is designed. These factors change the competition, force companies to fail and go bankrupt, or catapult some companies forward, but they don't change the flow of business from OEMs to contract manufacturers. My father owns a small business in NH, WesBell Electronics, which distributes copper wire products, and manufactures wire assemblies that eventually end up in electronic devices and appliances for OEMs. We don't engineer the harnesses to work electronically, instead the customer, such as General Electric, will send us a CAD drawing of the exact dimensions they need and we create it as a contract manufacturer. However, my research has shown that contract manufacturers in recent years are starting to complete more R&D work to support the demands of their customers, OEMs, which will force the competition to soon do the same or be left behind in the future. "Many manufacturing firms need to learn new techniques and strengthen their research and development (R&D) ability by different ways because there are many competitors, technology changes very quickly and consumers like to purchase new products. (Tung-Shan, 2016)"
I chose this domain because I'd like to grow my father's company into multiple locations throughout the USA long after he leaves. I already read one of the books in this class called, Unleashing Your Entrepreneurial Potential, by Raghu Nandan, which describes the difficulties of growing past one location that is in complete control of the owner. The author wants to change the fact that many Indian companies "die along with the old man". I plan to use the following research to dig deeper into that scenario, no matter the origin, so that I can overcome this issue. My father has this mentality which comes out in his personality when I discuss a second location in California or even down the street. By proving that contract manufacturing is not only a proven concept that has lasted for hundreds of years, but a concept that's in fact gaining popularity, I will be able to use the information to grow my father's business when he leaves. Everything in the world works on continuous improvement by improving every aspect of a business starting with cost reduction before the customer requests it, preparing for environmental changes, industry changes and also preparing to use the latest technology before the direct competition. Certain factors disrupt industries in certain ways, like when machines changed how farms operate, or how technology changed how humans communicate or how the great depression changed how careful we conduct business and account for money. Most farms, newspapers and phone books have nearly gone obsolete unless they bought the proper machinery or brought their newspaper online. Businesses must overcome these factors and turn them into positive aspects of the company that catapult them forward instead of stopping them in their tracks. If we all knew what caused recessions and great depressions we'd avoid them, but it's a phenomenon that we cannot avoid, as it's related to human emotions and behaviors. When times are tough for businesses they try to cut costs, cut middlemen, buy cheaper, lay off employees and sell assets. When times get tough we blame others, make strange decisions, get selfish and watch our emotions get the best of us. The great depression started about 100 years after the 100-year long industrial revolution, so some might say that the two were interrelated. It's possible that the transfer of jobs from working in fields to working on machines, or making clothes to designing and innovating machines, could have been a strong reason that so many people were out of work, and that education and training in new subjects was too hard of a concept to grasp for those job titles that had gone extinct. No matter what theory one believes, there's no question that the depression disrupted the normal flow of business and created selfish tendencies that disrupted it even more. At first glance, an OEM might decide to bring the contract manufacturing in house to reap the additional profits in which the contract manufacturer is currently making. The OEM could simply buy a few machines and hire a few people to save money during such difficult times. However, no matter who did the math it couldn't be determined that it was a good business plan to cut the contract manufacturer. Why? Because horizontal competition is different from vertical competition. Manufacturers sell to distribution and distribution sells to end users or things get messy. Automation, Quality, Process, Information and Innovation all change the way we do business horizontally, along with the recessions and revolutions. When times get tough, vertical change can be a very bad idea that can have long term consequences with relationships and integrity within the industry. Indeed, contract manufacturing companies made it through the great depression along with the support of their OEMs for a few reasons. First, one contract manufacturer can use one machine and one employee to support multiple OEMs for similar parts. Multiply that by 100 and it gets confusing on the eyes, but the concept doesn't change. The fact that the contract manufacturer can keep the machine running for longer periods of time, and keep the same employee working 40 hours a week running the machine, can all be translated into dollars and cents. Second, running an operation that supports five OEMs creates better structure, processes, management and trained staff to complete jobs faster, on time, and scheduled for exact delivery. Third, buying equipment, resources and products in quantity for five OEMs translates into savings that the OEM couldn't get alone. Finally, the fact that the contract manufacturer owns and replaces their equipment, pays the employee's salaries and holds inventory until the day of shipment means better cash flow for the OEM. All of that said, and considering a fair profit margin for the contract manufacturer, the OEM is getting a better deal through contracting the work than they are by doing the work in house. The industrial revolution had a much bigger impact on contract manufacturers because the world was moving forward, so those that stood still fell far behind. Automation and innovation turned manual labor into machines, people into equipment and hours into minutes. As contract manufacturers bought new equipment to lower costs they were able to offer better pricing to their OEM customers. On the other hand, those that didn't buy the equipment due to a high upfront cost started to lose business to those that did have the equipment. New machines were being developed around the world which created yet another competitive market. "Innovation enables companies to respond to customer demands promptly and accurately, and to carry out customer satisfaction management. (Lee, 2016)"
Inventions were game changers that contract manufacturers had to review and determine how much time it would save them, and how much of a return on investment they would receive. However, innovations during that time period were another game changer because it was an industrial revolution, meaning there were new possibilities every day. Each new machine could be used to improve the last machine, or work with another machine hand-in-hand, which gave the era a compounding or exponential effect. Companies continued to buy the latest in order to stay ahead of the competition, but problems arose from that strategic plan. For instance, buying a machine that will pay itself off in 5 years was a smart decision on Day 1, however a bad decision when a new and improved machine replaced it in 3 years. This brings up a tough financial decision of keeping up with the competition compared to waiting 5 years to get a solid return on investment. Fast cars and horses need trained drivers and jockeys. The industrial revolution was creating new machines that had never been seen, used or operated before which means hiring or training an educated machine operator was yet another challenge to face during this era. "The innovation era occurred when manufacturing companies enhanced their productivity not only with innovating technologies but also with management skills, and by making the most of their intellectual property. (Lee, 2016)" Lee discusses innovation and automation over a 30 year period between 1980 and 2010, but it relates well with the era of the industrial revolution, and my father's company is currently 28 years old, falling into that time period. Lee digs deep into the keywords affecting contract manufacturing such as Innovation, Automation, Cost, Energy, Environment, Information, Labor, Process and Quality. The technological revolution fits nicely with Lee's research because technology helped create innovation, automation, energy, information, process and quality which are most of his keywords. This was yet another era of time that forced contract manufacturers to comply with new standards, invest money, educate themselves, and hold on to a well-trained management staff that could implement new processes and controls. Technology came even faster than machines in the industrial revolution, again at a compounding or exponential rate. Technology was quickly used to support more technology such as using web design software to build a website, or using a graphical user interface to create accounting software, or building the internet with software tools and databases. Technology soon created strict demands for contract manufacturers for better quality, faster production times, lower costs, detailed forecasts produced electronically, online brochures (websites), online purchasing capabilities (e-commerce) and all of the product information online for customers to review without picking up the phone. Before inventory databases were available with a few clicks, it took some time to determine if there was a sufficient amount to be sold on a particular day, and those without the capabilities soon looked foolish, and soon became nonexistent if they didn't adhere to the new era of technology. By this point WesBell Electronics was in business, founded in 1988, and adhering to the changing times of innovation, automation, technology, quality and controlled processes. Some of their customers were demanding that they adhere to vendor standards, so they did, and they repeated that mentality across the rest of their customers as well. With customers like GE on their list it can be easy to foresee changing times because the demands from GE come before the advertising on television, and long before other customers' demands as well. For instance, WesBell needed to become ISO 9001 certified to remain a vendor for GE, they have to create 5-7% cost savings every year by innovating, and they have to have updated information readily available at all times. It's easier to believe in a new era when fortune 500 companies are already on board, and it's comforting to know before putting investment dollars into something that might not turn into a new era. Global competition became more of a factor when technology shrunk the world into a smaller business atmosphere through the internet, and technology is taking it to another level by creating language interpretation software that will allow for a new relationships to develop. WesBell Electronics manufactures wire harnesses and cable assemblies for GE that aren't shipped to GE, but instead get sent to China and Mexico for additional labor at low rates. Contract manufacturers, along with numerous US companies, are losing business to overseas competition, not necessarily due to quality of product, but for cheap labor rates. WesBell didn't exist during the great depression or industrial revolution, but even if they did, I doubt they would have just sat back and watched themselves wither away while the competition grew. "Contract manufacturing can be a game-changer in a double sense: not only does it serve as a trajectory to full development in late industrialization, but it makes those economies housing this industry the catalysts transforming regional or global trade and development, in spite of the size of their economy. (AN-CHI, 2012)" Sometimes recessions and depressions are so bad that companies need to invest money to remain stagnant, but at least they aren't falling behind. It's becoming harder to get orders that used to be common, it's getting harder to keep customers and it's getting much more competitive in general because there's more players in the game. How can the US compete with such low labor rates? First by offering a more quality product with a proven process that guarantees quality more often. Since LEAN manufacturing has become more prominent with Just-In-Time deliveries, quality becomes more necessary because production downtime is one of the most expensive things a company needs to cover. Imagine buying one million parts from China at a bargain price only to find an error, not that China is more prone to make errors, but the logistics of shipping the parts back to be reworked could take weeks to fix. "Many original equipment manufacturers (OEMs) use contract manufacturers to produce parts or even entire products. These businesses demand accuracy, a competitive price and prompt delivery sometimes on the same day the order is placed. (Mowry, 2011)" There's an opportunity for competitive advantage, be close, be lean, be quick and never undermine the quality control process. "Following the lead of Allon and Mieghem (forthcoming), we consider a US OEM outsourcing production to two contract manufacturers with complementary profiles: a low-risk but low-margin local manufacturer (e.g. in the US or Mexico) and a high-risk but high-margin overseas manufacturer (e.g. in China). (Su, 2015)"
A second way WesBell has proven to win business from countries with low labor rates is automation and innovation. Some projects and contracts from GE and large OEMs are so big they warrant their own R&D, innovation and automation tactics. Literally, one of a kind equipment designed specifically for certain jobs that require cost savings year over year. OEMs don't just arbitrarily request cost savings, they expect their contract manufacturers to continuously improve their operations and pass a piece of the cost savings along. If you're not improving and not lowering costs then you won't be worthy of playing in the big leagues, or perhaps even the minor leagues. A final competitive way to win business in the global market is relationships. That doesn't mean that a friend of a friend will give you any contract for any price. A well-developed relationship starts with research of the company, location and board members. When dealing with global clients it will be important to conduct business with their nationality and heritage in mind. Will there be 15 minutes of chit-chat before discussing business or will the meeting get started upon arrival? Will the meeting be in the office or over dinner? Should you wear something specific, speak a certain way or bring certain materials? Creating the relationship allows you to understand something before it happens, like when your spouse lets out a long sigh and you quickly pick up the body language. "He's my friend, I should've been awarded that contract!" No, never the case, but instead, "He's my friend, so I know exactly what he wants and I'm going to make sure I win this contract!" In conclusion, there are many factors that affect contract manufacturers over time, whether it be horizontally, vertically, internally, externally, locally or globally. Companies don't just fail because of what happens in the world or how the competition seems to be perfect in every way, like your neighbors grass, but instead it's how we react to these factors without letting them crush us. How do we use them to our advantage? We embrace innovation, automation, process, quality, control, energy and information, and improve them every day. Some sayings have been used for so long it's easy to overlook them, but every dollar counts, practice makes perfect and baby steps climb mountains. Most people over estimate what they can do in a day and under estimate what they can do in a year. Nandan, R. (2009). Unleashing Your Entrepreneurial Potential. Business Books from SAGE.